You guys know the editor does not have the UMM_GeneralAmbience or even SoundPacks packages as are shown in the tutorial? This is what I see within that structure.. 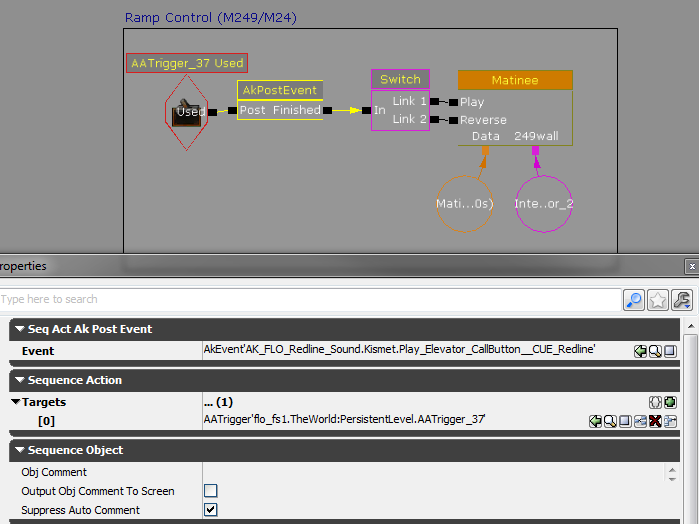 Even if I follow the kismet tutorial to the letter as best as I can understand, but rather loading sound banks from the Ambient_Packages I still can't seem to get working with the sounds, I also can't find anything called SB_UMM_ReverbMedia to follow the reverb part of the tut. I simply needed to load any of the soundbanks from the maps [in the packages above], add them to loadbank actions in kismet then set any ambient events from them banks I added to the level, as targets in the start ambient sound kismet action and boom, sounds are coming through. Yep, Sounds work in the editor if you mean the sounds of gunfire, running etc and have done since the release.. but to add the ambient sounds and reverbs Wwise style you have to load the banks and then have them start (as shown in my kismet) otherwise whatever events you put in won't be audible in the map. I'm confused about the tutorial tbh, as lots of whats stated in there we don't actually have to work with in the editor so I been winging it so far. Yea make sure you have the right priority set for the inside reverb volume. In this example I have the target being the trigger, which would work on a button like you are asking about, actually this is for a button on my map that controls a ramp, Im using the elevator call button. You can actually also just add the target into the properties, I like doing it this way to help keep the kismet visually smaller. Im thinking you could probably even make the target be the instigator. Nice one I eventually got it working like this.. I have been really struggling with this new approach to sounds has to be said, I probably spent about 6 hours yesterday just trying to figure out how to even use them, then spent another 6 after I learned how to, trying to get a simple trigger set up. So you are wanting to toggle an ambient sound? Turn the light on, ambient buzz sound fills the room, turn the light off, ambient buzz sound turns off? It looks in your kismet there that you have no way of "toggling" the sound, only loading the akbank on the trigger push. Nothing is turning it off or "unloading" the akbank expect at Level Loaded. Still not sure exactly what you intend to do, but Im thinking you should have the AkLoadBank "load" on "Level Loaded" and break the link from finished to start target. 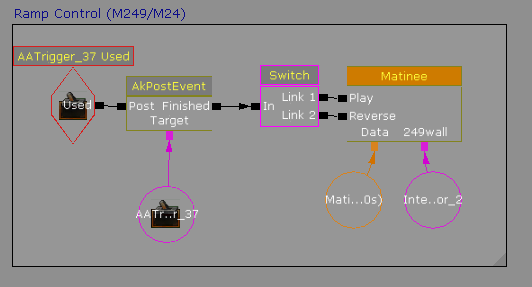 Then, add a switch to the trigger, connecting to AkStartAmbientSound, Switch 1 to Start Targets, Switch 2 to Stop targets. That should work as a toggle for the actual sound. I have no idea about the sound and radius. I'm curious about that as well. Wheres that like button when you really need it? cheers man, this has sorted it the ol' switcharoo! Going to need a tutorial for this. Just want to make a custom objective sound from a wave file and I'm confused. If your wanting to use a wave file you can still use it the normal UDK way, import it into your map and use it however you need in your level. 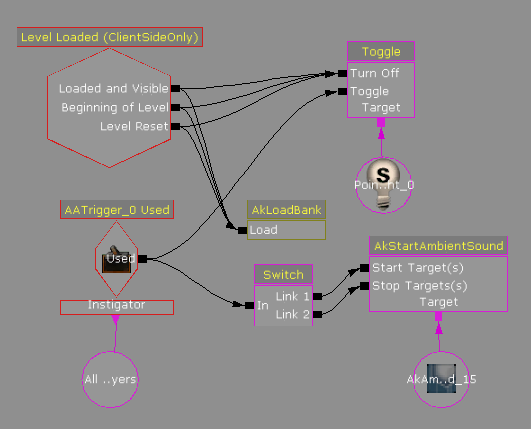 You can have and use both methods of sound production, Wwise and Unreal simultaneously in a map. I do agree that a more detailed (and one that pertains to the assets we have at our disposal) tutorial would be beneficial, quite honestly if I was entirely new to mapping again, that tutorial would completely put me off making maps, its like reading jargon and not 'new user' friendly like whatsoever. Doesn't work for the objectives. The objectives require the AKDetails. If you guys can make a master list of questions I can take it back to the sound team and expand upon the guide. Instead of trying to place your sound in the properties of the objective, have you tried using kismet to play the sound tied to the objective? Bummer, I wonder if we can convert our imported 'standard' sounds into something usable by Wwise by making these 'Soundbanks' and 'AKEvents' ourselves somehow.. I'm guessing not and that we would probably need the actual Wwise software itself (rather than UDK) for something like that? Forgive me but the guide kinda assumes were all graduates from the Royal College of Wwise. I was able to get the ambient sounds working fairly easily. Unfortunately, as I said, the ability to import your own sounds and make AKEvents seems to be impossible or at least not to the level that I am able to figure out.